Looking at the façade of a historical building, it is often difficult to distinguish between the original decoration and later additions. 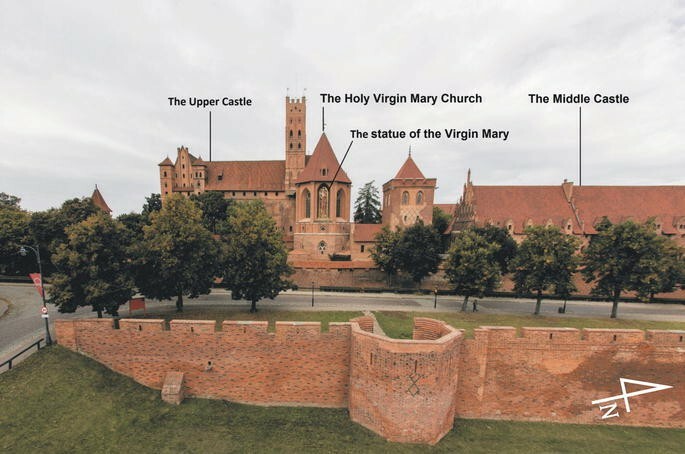 One such building is the Holy Virgin Mary Church at the Malbork Castle (Northern Poland), built between 1276 and 1406. During the latest restoration works, ceramic tiles with some remnants of the green glaze, decorating the Holy Virgin Mary Church façade, were studied in situ using portable X-ray fluorescence spectrometry. Micro-samples were analyzed in laboratory by scanning electron microscopy with energy dispersive X-ray spectrometry (SEM–EDS) and wavelength-dispersive X-ray spectrometry (SEM–WDS), micro-Raman spectroscopy and powder X-ray micro-diffraction. We found that what was originally thought to be a paint layer was in fact a heavily deteriorated SiO2–PbO glaze. White, yellow and black pigments were found to have been added into the glaze as opacifiers and colorants. Copper and iron were used as glaze colorants. The originally added pigments were transformed into new phases, such as antimony-doped tin oxide. The technology used to produce the glazed tiles was identified. All the results collectively confirmed the medieval origin of the green glazed tiles. Gothic green glazed tile from Malbork Castle: multi-analytical study. Built by the Order of the Teutonic Knights of St. Mary’s Hospital in Jerusalem (Deutscher Orden) between about 1276 and 1406 , the castle in Malbork (Marienburg) (Fig. 1) is one of the largest medieval monastic fortresses in Europe. The Holy Virgin Mary Church is located in the oldest part of the castle, the so called Upper Castle, erected between 1276 and ca 1300 . Situated on the first floor of the eastern part of the castle’s northern wing, it was originally built as a chapel . The peak of the castle’s development dates back to 1309, when the headquarters of the Teutonic Order were moved from Venice to Malbork. After 1309 (until 1344) the chapel underwent big construction works—an upper storey was added and the chancel was rebuilt. At that time a huge statue of Virgin Mary with the Child Jesus was placed in a niche on the eastern façade of the church. In the course of the Thirteen Years’ War (1454–1466) the Teutonic Order moved to Königsberg and left Malbork Castle to Bohemian mercenaries in payment for their services. In 1457 the citizens of Gdansk bought the castle from them and handed it over to the Polish king Casimir IV Jagiellon. During Polish rule the castle and the church did not change much. In 1626, the church was devastated by Swedish army, while in 1644 a vast fire destroyed the roofs and galleries of the Upper Castle. For a long period the church was used as a storehouse and fell into ruin. As the result of the first Partition of Poland, in 1772 Malbork became part of Kingdom of Prussia. In 1804, pursuant to an edict issued by Frederick William III, king of Prussia, the ruined fortress became a national monument. Because of its political significance, it was possible to find funds for its restoration. Unfortunately, that romantic restoration led to its Neo-Gothicisation. From 1882 until the outbreak of World War II a more respectful restoration took place under the direction of Konrad Steinbrecht, yet nowadays it is sometimes difficult to distinguish between the original decoration and nineteenth century interventions. In 1945, the Holy Virgin Church was largely damaged, including its roof and vaults, by heavy artillery shelling. In the last 2 years (2014–2016), it underwent extensive conservation and building works . The castle is a representative example of the Red Brick Gothic architectural style with its characteristics ornaments made of dark-glazed headers. The southern façade of the church, together with the other three wings of the Upper Castle, forms an inner courtyard decorated with a blind arch frieze with vine ornament made from tiles (Fig. 2a). The oldest tiles, which are studied in the present article, are situated on the eastern part of the southern façade of the church (Fig. 2b on the right); they date back to the first construction phase of the castle. They were described in 1989 by Jurkowlaniec  as moulded, glazed and fired ceramic tiles and dated to ca 1290. Next to them we see Neo-Gothic replicas (Fig. 2b on the left) introduced in nineteenth century in the place of medieval tiles from the castle’s extension after 1309. The Neo-Gothic tiles run along the four façades of the inner courtyard of the Upper Castle. The original tiles from the castle’s extension are exhibited in the Museum. Interestingly, in a publication from 2010, they are classified as painted . The question has arisen whether the studied tiles were painted or glazed. Tiles similar to the oldest ones from the first construction phase of the Malbork Castle were found in Elbląg castle (German-Elbling) and dated to 1260–1270 . The Malbork Castle tiles are bigger (24 × 24 cm) from the ones from Elbląg (19.5 × 19.5 cm), which clearly shows that different moulds were used for their production. Moreover, no traces of polychromy or glaze were noticed on the Elbląg’s tiles. Identical tiles (24 × 24 cm) to the Malbork ones where found in Brandenburg (Polish-Pokarmin, Russian-Ushakovo) castle and Lochstedt (Russian-Pavlovo) castle , which means it was a common ornament. As for the tiles from the façades of Malbork Castle, findings from 1996 indicate that they could have been used as well for the interior decoration . The chemical composition of glazed building ceramics is widely discussed in the context of tiles from ancient Near East [7, 8] or azulejos, typical for Portugal and Spain . Italian medieval glazed brick technology was discussed in a recent publication from 2013 . German glazed brick tradition is analyzed with regard to conservation issues . Most studies of glaze concern pottery and archeological findings . On the other hand, medieval architectural ceramics, especially Northern and Central European, still needs to be studied. 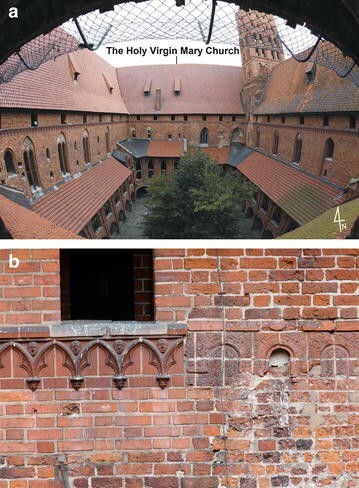 The aim of this study, accompanying the recent restoration works conducted in the Upper Castle in Malbork, was to examine and date the green and grey patches of color found on the blind arch frieze with the vine ornament on the façades of the Holy Virgin Mary Church (Figs. 2a, b, 3). 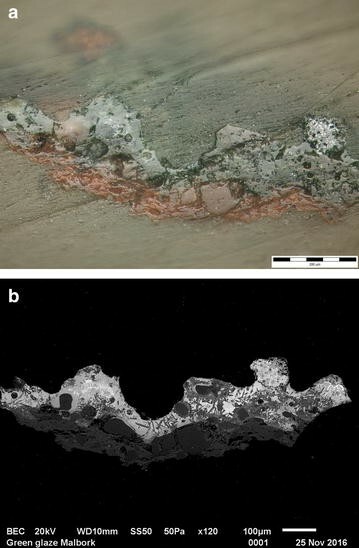 Our paper presents the results of the analysis of what the restorers initially thought to be a paint layer but in the course of the scientific investigations turned out to be a heavily deteriorated green glaze. With the help of art restorers, nine locations were selected, where non-invasive XRF in situ analysis was carried out using a DELTA Premium (Olympus Innov-X, USA) hand-held energy dispersive X-ray fluorescence spectrometer equipped with an X-ray lamp with a Rh anode and a silicon drifted detector (SDD). The device enables measurement of elements heavier than Mg (Z > 12). After p-XRF measurements, and based on the preliminary results, three micro-samples were taken. The samples for stratigraphic studies were embedded in epoxy resin, Epofix (Struers), and polished on a mechanical grinder-polisher Labo-Pol 2 (Struers) using silicon carbide waterproof abrasive foils at successive grits of 180, 320, 500, 1000, 2000, 4000. For the final diamond polishing suspensions of 3 and 1 µm were used. In this paper we present the results obtained mainly for sample II.1.2.1.6. A sampling site is shown in Fig. 3. Cross-sections of micro-samples were studied (Fig. 4a) both in visible and polarized reflected light using two microscopes: a Leica DM4000 m equipped with a Leica DFC295 camera and an Olympus BX51 equipped with an Olympus E600 camera (Quick Photo Camera 2.3 software). Cross-sections were inspected (Fig. 4b) with a Jeol scanning electron microscope (SEM) JSM-6510LV equipped with an energy dispersive spectrometer (EDS) by Oxford Instruments with a silicon drifted detector and with a wavelength dispersive X-ray spectrometer (WDS) by Oxford Instruments. Features of EDS: resolution 125 eV (Mn), detection limit 0.1 wt%; features of WDS: resolution 2–10 eV, detection limit 0.01 wt%. EDS measurements were carried out in low vacuum mode under a pressure of 50 Pa and accelerating voltage of 20–25 kV, working distance —10 mm, acquisition time—from 35 to 100 s. For the EDS semi-quantitative results no standardization has been performed. Because of the low content of P, Sn, Sb, Zn (close to or below the EDS detection limit) and possible overlaps between characteristic X-ray peaks of Pb, Mg and As: Pb Lα–As Kα (difference of 8 eV), As Lα–Mg Kα (difference of 28 eV), we took the decision to use the WDS detector. The problematic elements with their X-ray energies are listed in Table 1. For WDS measurements of Mg, P, Zn, As, Sn and Sb the conditions were as follows: high vacuum, accelerating voltage of 25 kV, working distance—10 mm. In order to avoid charging, the sample analyzed with WDS was coated with carbon. Quantitative analyses with EDS were executed after quant optimization on Co standard. Quantitative analyses with WDS were performed after prior standardization. We used as standards Mg, InP, Zn, GaAs, Sn and Sb placed in stainless steel mount produced by SPI. For the standardization of Mg an P their Kα-lines were chosen and for the rest of elements (Zn, As, Sn and Sb) Lα-lines were chosen. The EDS and WDS spectra were analyzed with INCA software by Oxford Instruments. For a glassy matrix and the black particles we present the raw data without normalization to 100%; the results are expressed as oxides wt%. Powder X-ray micro-diffraction data were collected from the cross-section with a PANalytical X’Pert PRO diffractometer equipped with a conventional X-ray tube (CoKα radiation with a wavelength of 1.7890 Å, 40 kV, 30 mA, point focus), a glass collimating mono-capillary with an exit diameter of 0.1 mm and a multichannel position sensitive detector (X’Celerator) with an anti-scatter shield. Diffraction patterns were recorded from 4° to 80° in the 2θ interval, counting time of 2200 s per step, step size of 0.0334°. The scan was collected for around 11 h. Qualitative-phase analysis was performed with the HighScorePlus software package (PANalytical, version 4.5.0) and JCPDS-ICDD PDF-4 database . Raman measurements (Figs. 7, 12, 13) were performed with a Nicolet Almega Dispersive Raman Spectrometer, equipped with an Olympus confocal microscope and motorized stage. Depending on the sample properties, 780 or 532 nm excitation line was used. The power of the laser was reduced to 25–50% in order to avoid sample overheating. The typical exposure time was 15–45 s. Each spectrum was collected from two scans. The spectral resolution was about 2 cm−1. Additional Raman measurements (Figs. 6 and 9) were performed with a Renishaw inVia Reflex micro-Raman spectrometer, equipped with a Leica microscope and motorized stage. The argon 488 nm excitation line was used. The power of the laser was reduced to 10% in order to avoid sample overheating. The spectral resolution was about 2 cm−1. 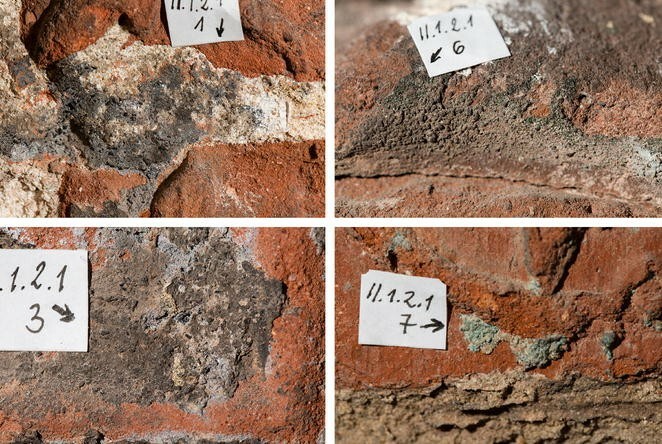 Some green, greyish green and grey patches of color were found on the surface of the tiles, as well as gray patches on mortar joints; they were analyzed with a portable X-ray fluorescence spectrometer (see Table 2). In situ measurements revealed the presence of considerable amount of silicon, sulfur and calcium, and small content of aluminum, potassium, iron, copper and lead. Additionally, tin, antimony and arsenic were detected in green and greyish green areas. In grey areas no copper, tin nor antimony were observed, but some traces of zinc. Strontium, titanium, manganese appeared in minute quantities regardless of the analyzed color . On the basis of preliminary results obtained by p-XRF and macro photographs of the sampling sites (Fig. 3), we interpreted the grey patches as points of dirt accumulation on the top of possible retouches (presence of Zn). The presence of Pb in the grey areas is questionable and most probably overestimated because of spectral interferences and the overlapping peaks of S (Kα1 2.309, Kβ1 2.465) with Pb lines (Mα1 2.342, Mβ1 2.444). For further analysis samples from dark green, green and greyish green areas were collected. The chemical composition of the crystalline phases of the tile’s ceramic body was determined by SEM/EDS (see Table 3—EDS analysis and Fig. 4a, b), µ-XRD (Fig. 5) and micro-Raman spectroscopy (Fig. 6). According to experimental studies, the temperature and the conditions (oxidising or reducing) in the kiln could be deduced from the brick final phase composition [15, 16]. The presence of quartz (SiO2) and microcline (K2O·Al2O3·6SiO2) together with the absence of mullite [Al4+2xSi2–2xO10–x (x~0.4)] in the ceramic body indicates that the maximum firing temperature of the Malbork tiles was around 1000 °C . Above 1000 °C microcline disappears completely, while mullite starts to form at around 900 °C . At ca 800 °C calcite and dolomite decomposes  and new phases, such as diopside (CaO·MgO·2SiO2), occur [15, 16]. The presence of diopside (CaO·MgO·2SiO2) indicates the raw clay material contained calcium and magnesium. In the case of the tiles studied, the higher content of Mg than Ca indicates that dolomite (CaMg(CO3)2)  or simply magnesian calcite (Ca, Mg)CO3 was present in the raw material rather than calcium carbonate (CaCO3) (Table 3). On the basis of EDS analysis, we can classify the raw material as a Ca-poor clay. The red color of the brick is due to iron oxide—hematite (Fe2O3) (confirmed by micro-Raman—Fig. 6). Based on the diffraction pattern obtained from the ceramic body, we can presume some magnetite (Fe3O4) might be present as well, although that should be confirmed by other techniques (the lines are at the level of noise) (Fig. 5). The chemical analyses of the glassy phase were performed mainly with SEM/EDS; WDS was used for a precise confirmation of the minor elements revealed by in situ XRF analysis but not detected, or on the level of detection limit, in EDS measurements (As, Mg, P, Sn, Sb and Zn) (see “Methods” and Tables 1, 4). We measured the area of pure glass far from the undissolved or recrystallized phases of opacifiers and colorants. The green glaze can be characterized as silica–lead glaze with a low content of alkalis (Na, K, Ca and Mg ≈ 7.7 wt%). Silica–lead–alkali glaze was produced in Near East since 1500 BC . In the West, lead glazes occurred during the Roman era (first century BC—first century AD) [7, 12]. The methods of preparation of silica–lead glazes (high lead and alkali glazes) were described by Tite et al. . Lead in the form of oxide was mixed with silica—in case of high lead glaze, as ground quartz or quartz sand, while in case of alkali glass, quartz was beforehand pre-fritted with alkali . In the case of the Malbork tiles, the results indicate lead was mixed with the mixed-alkali glass (Na, K, Ca, Mg, P confirmed by SEM/EDS/WDS). 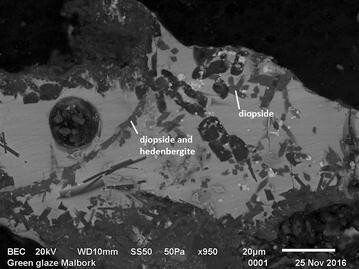 Phosphorus (confirmed by SEM/WDS) usually comes into the mixed-alkali glass from plant ash . Such glaze mixture was applied on the clay body in water suspension and sometimes mixed with a binder (gum, starch, clay). In our case, tin opacifier and colorants (Cu, Fe, Sb) were added to the mixture and they partly (Sn, Sb, Cu) or completely (Fe) dissolved in the vitreous matrix during firing. Low concentrations of Sb (0.53%) and Sn (0.51%) were confirmed in the glassy phase by WDS (see Table 4). Results of our previous works  show that the concentration of SnO2 may vary from 0 up to 20 wt% in white opaque glass, depending on the thermal treatment of the sample, solubility of intermediate phases such as PbSnO3 in the glass [22, 23] and place of measurement (SEM/EDS). Low quantities of aluminum detected by EDS (3%) in the glassy matrix are most probably related to the diffusion of elements from the clay body to the glaze during firing as reported by Tite et al. , although one may not exclude that some clay  was added to the glass frit as well. The silica–lead glaze applied on the tiles in Malbork as far as the Si/Pb ratio is concerned is similar to Islamic glazes from Zaragoza from eleventh century  or to Spanish luster pottery , or to some examples of the Italian renaissance maiolica . Opacifiers make glass non-transparent and give it a color hue. The oldest known opacifiers were antimony-based: lead antimony yellow and calcium antimonate . Tin-based opacifiers (lead stannate yellow and tin oxide) appeared in Europe for a short time in 2nd–first centuries BC, and then reappeared in the fourth century AD and replaced the antimony-based opacifiers . 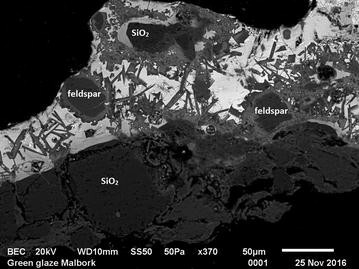 In the Malbork tiles, we identified a tin-based opacifier—cassiterite SnO2 (micro-Raman spectroscopy—Fig. 7, and SEM/EDS mapping—Fig. 8), as well as an antimony-based opacifier—Naples yellow (micro-Raman spectroscopy—Fig. 9), which was used rather as colorant (see below). In Venetian’s manuscripts cassiterite mixed with silica–lead glass was known as lattimo . According to Molera et al. , the silica–lead–tin glaze was made in two steps. In the first stage lead and tin, in the form of oxides (PbO, SnO2), were mixed together and roasted. In the second stage, the powdered metal oxides were mixed with quartz (or alkali glass frit) and then melted and crushed. In this way SnO2 was evenly distributed in the glass layer, and the glaze was homogenously opacified. In case of the Malbork tiles, further analyses indicated the use of two yellow pigments—Naples yellow (SEM/EDS, micro-Raman spectroscopy—Fig. 9) and lead–tin yellow type I (SEM/EDS, µ-XRD—Fig. 10), which were probably added as a mixture . According to recipes, these two yellow pigments were used in the mixture known as giallolino which originated from Germany (Alemagna). It appears in manuscripts from the 2nd half of the 15th century, but it is estimated that giallolino was applied already about 150 years earlier . Black particles containing Cu were studied by SEM/EDS/WDS (Table 5; Figs. 8, 11) and identified by micro-Raman spectroscopy (Fig. 12) as tenorite (CuO). Undissolved particles of tenorite gave the glaze a darker hue, and that is why some of the rests of glaze found on the vine ornament appeared dark green to almost black. As an initial phase burnt copper (in the form of a mixture of Cu oxides ) (e.g. Spanish copper oxide-calcinated metallic Cu)  was most probably added. However, we may not exclude that copper filings [30, 31] were added and during the firing process in oxidising atmosphere turned into tenorite. Burnt Cu was widely used in ancient and medieval glasses and glazes . There is also a Renaissance recipe of Piccolpasso (The Three Books of the Potter’s Art, para. 65–66, 81) described by Tite  for a “mixed green”, consisting of copper oxide (called “Ramina”) mixed with lead oxide and antimony oxide. Tite reports the presence of copper with lead antimonate in the green glazes of Andrea della Robia’s panel “Virigin and Child” . According to the author, in that case lead antimonate particles are responsible for the opacification. The green silica–lead glaze contains relatively high concentrations of dissolved Cu (9.4%) and Fe (3.3%) (expressed as oxides wt%) (Table 4; Fig. 8). The presence of copper in the silica–lead glass gives it a bright green color  and in the lead–alkali glazes a bluish green hue . The copper ions present in the glassy matrix are responsible for the green color [30, 34]. Iron ions may give a shade ranging from bright yellow to brown . In the Piccolpasso recipe for yellow color (called “Zallo”) we find information about the addition of iron oxide in the form of rust (called “Ferraccia”) to yellow antimonate . We assume that copper and iron were added deliberately to the SiO2–PbO glass. However, it cannot be excluded that part of the iron ions were released from the ceramic body during firing. Further analyses showed that some new phases were created during the firing process as by-products of the reactions between yellow, white and black colorants and opacifiers. The tin oxide reacted most probably with Naples yellow and a new phase, antimony-doped tin oxide (SnO.5SbO.5O2), confirmed by µ-XRD (Fig. 10), EDS mapping (Fig. 11) and micro-Raman spectroscopy (Fig. 13) , was formed. The diffraction pattern also shows the presence of wollastonite (CaSiO3) (Fig. 10) which recrystallized from melt. Moreover, a new phase—monimolite (Pb3(SbO4)2) was detected by µ-XRD (Fig. 10). In the glaze layer, we identified unmelted grains of potassium feldspar and quartz (see Fig. 14) (in backscattered electron image, black grains of ca 25–50 µm in diameter). Tite  describes a deliberate addition of clay containing potassium feldspar and quartz to glazes applied on maiolica in order to fix better the second layer in the two-layer glaze type. We assume the grains were rather separated from the ceramic body during the application of the wet glaze suspension on the unfired dry body, or later on, during the firing process. Had clay been added deliberately, the particles would be homogenously distributed in the glaze. 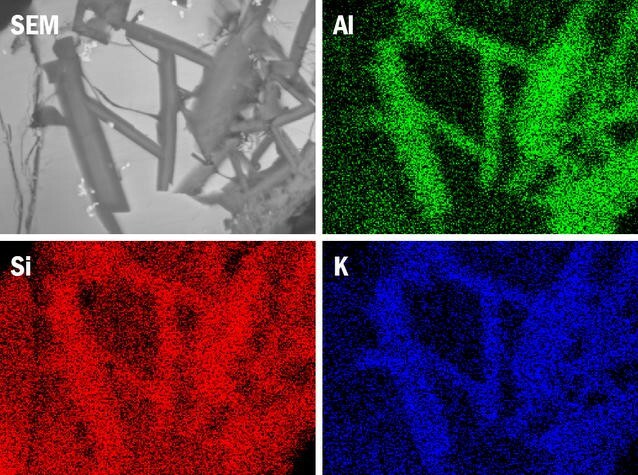 In SEM/BEC images we observed a noticeable transformation of the potassium feldspar covered by a thin layer of a new phase (containing K–Al–Si and Pb) created during firing (Fig. 14). Plate-shaped crystals at the interface have the same chemical composition as this thin layer (Table 6; Fig. 15). The presence of this phase indicates that the dry ceramic tile was burned together with the glaze in one firing. The interaction of ceramic tile and glaze was described by Tite et al. and Adorni et al. . The authors defined this ceramic body-glaze phase as K0.4 Pb0.6 Al1.2 Si2.7 O7. 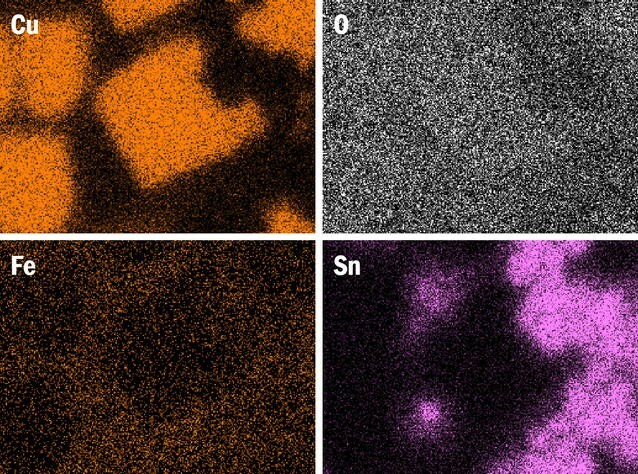 A secondary crystallized phase, containing Si–Ca–Mg and Fe (Fig. 16), was formed during cooling (devitrification) in the glassy matrix. It is possible that it is a solid solution of diopside (CaO·MgO·2SiO2) and hedenbergite (CaO·FeO·2SiO2) (confirmed by SEM/EDS) [12, 37]. 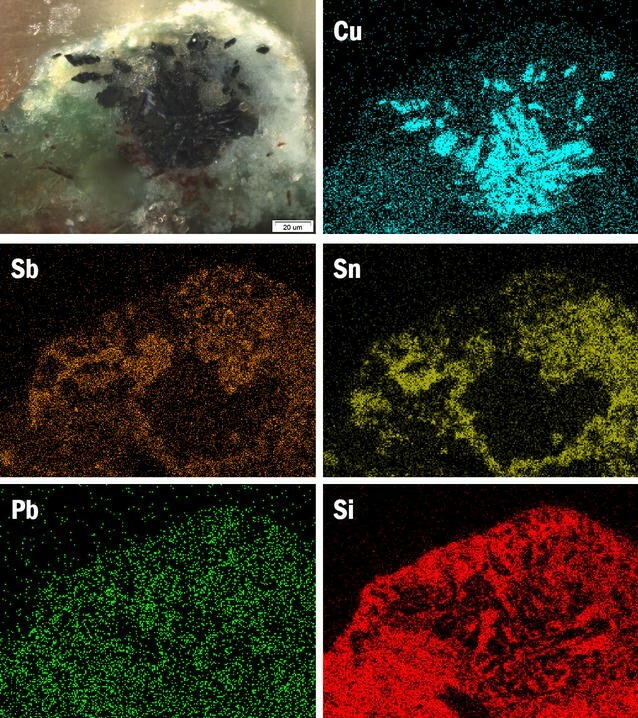 The separated feldspar grains, together with unmelted SiO2, newly formed crystals (K–Al–Si–Pb, diopside and wollastonite) as well as gas bubbles increase the opacity of the glaze. The poor state of preservation of the glaze may be linked with harsh weather conditions—big changes in relative humidity and ambient temperature—that led to formation of cracks in the surface layer of the tiles. The climate in Malbork is classified by Koppen as humid continental, which means the tiles are exposed to high humidity. As Malbork is situated in the coastal area (ca 40 km from the Baltic sea), NaCl could penetrate the glaze through the microcracks. Water, when freezing in the microcracks expands in volume and causes fractures. Porous materials, such as ceramics, absorb water during the rain and expand. Moisture expansion of the ceramic body is a known phenomenon [38, 39]. The tiles studied are situated on the southern façade, so they dry quickly, loose water and shrink. Differences in moisture expansion between the body and glaze may possibly have influenced the glaze detachment. Another corrosion product is gypsum, found by micro-Raman spectroscopy in the ceramic body (Fig. 6). The calcium carbonate from the brick or adjacent mortar joints reacted with sulphur in the air and formed gypsum—process known as sulphation or chemical weathering . The glaze studied turned out to be a very complicated system. In order to unveil the secrets of its production we used a set of analytical methods. The morphology of the interface layer together with the composition of the glassy matrix and ceramic body clearly show that the glaze was applied on the dried clay body and fired in the kiln at one step at the temperature less than 1000 °C, but certainly more than 800 °C. The silica–lead glaze applied on the ceramic tile was colored with copper and iron ions and opacified/colored using the artificially prepared pigments—white (cassiterite SnO2 melted with PbO before adding to the glass), yellow (mixture of Naples yellow and lead tin oxide type I), copper filings (most probably in the form of oxides as burnt copper). The originally added yellow and white pigments were transformed into new phases, such as Sb-doped tin oxide (Sn0.5Sb0.5O2) or monimolite (Pb3(SbO4)2). Tin-opacified glazes have a long history. We observed some similarities between Malbork’s glaze with Zaragoza glazes from 11th c. (Si/Pb ratio) and also with Italian maiolica (Si/Pb ratio, copper oxide and lead antimonate mixture). The technologies used confirmed the medieval origin of the green glazed tiles. SSP coordinated the overall project, collected the samples, prepared the cross-sections, performed some of the EDS measurements, interpreted the Raman spectra and wrote the paper together with DR. PS performed the EDS and WDS measurements, interpreted the diffraction patterns and wrote about electron microscopy. DR planned further EDS analysis, interpreted the data obtained taking into account the knowledge in the field of glass technology and wrote the paper together with SSP. All authors read and approved the final manuscript. The authors would like to thank the consortium Monument Service, Gorek Restauro, POiKZ Malbork for providing the samples and co-funding the research. SSP would like to thank professor Maria Poksińska from Nicolaus Copernicus University in Toruń for her precious advice. A special thanks to Dr. David Hradil, RNDr. Janka Hradilová (ALMA Laboratory, Prague) for p-XRF measurements, Dr. RNDr Petr Bezdička (ALMA Laboratory, Prague) for μ-XRD measurements and help in data interpretation, dr Grażyna Żukowska (Chemical Faculty, Warsaw University of Technology) and Jan Pokorný (Institute of Physics of the Czech Academy of Sciences) for micro-Raman spectroscopy measurements. We also wish to extend our thanks to Ing. Alexandra Kloužková, CSc. (Department of Glass and Ceramics, University of Chemistry and Technology Prague) for valuable advice. We extend special gratitude to Grzegorz Muszyński for linguistic improvements. The research was carried out within the framework of the project “Conservation and building works in the complex of the Holy Virgin Church in the Castle Museum in Malbork”, co-funded from the European Economic Area Financial Mechanism for the years 2009–2014 (EEA FM 2009–2014), within the Programme Conservation and revitalisation of cultural heritage. Writing the manuscript was possible thanks to the funding of Academy of Fine Arts in Warsaw, Faculty of Conservation and Restoration of Works of Arts. The research project was supported by the National Science Centre in Poland (Grant No. UMO-2015/19/N/HS2/03503). Principal Investigator: Sylwia Svorová Pawełkowicz. Emery A. Malbork castle–Poland. Castle Stud Group J. 2007;21:138–156. http://www.castlestudiesgroup.org.uk/Malbork%20-%20Anthony%20Emery.pdf. Accessed 3 Sept 2016.
http://www.funduszeeog.zamek.malbork.pl/index.php?mod=aktualnosci&aid=20. Accessed 11 Dec 2016. Heraclius, De coloribus et artibus Romanorum, Liber III, 3, 7, 8. https://www.hs-augsburg.de/~harsch/Chronologia/Lspost10/Heraclius/her_col3.html. Accessed 6 Mar 2017.